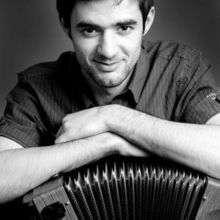 SEÁN ÓG GRAHAM is from Portglenone, Co. Antrim and is one of Ireland’s most dynamic young button accordion players. He has achieved numerous All-Ireland titles and is also a gifted, self-taught guitarist. A founding member of Beoga. he has several television appearances to his credit, and has appeared as guest soloist with the Irish Harp Orchestra, the Canadian Youth Orchestra and Alan Kelly’s ‘Celtic Legends’ show. He has recorded with various Irish musicians and recently he has been accompanying Solas members Winifred Horan and Mick McAuley at their ‘Serenade’ concerts in Ireland and Europe. He is also a talented composer and a wide range of influences is evident in his music writing. Seán Óg is a graduate of the Limerick based Irish World Academy of Music.